Location: Cook County, Old Chicago Portage Forest Preserve, junction of Portage Creek with Des Plaines River, just west of Harlem Avenue on the line of 47th Street. Chicago owes its very existence to its strategic location on the Chicago-Illinois River route, one of the natural arteries leading from the St. Lawrence River system to the Mississippi. 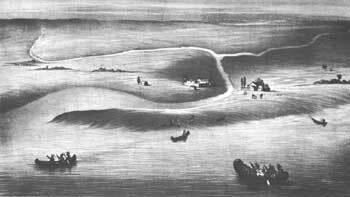 The portage at Chicago was discovered in September 1673 by Père Jacques Marquette and Louis Jolliet as they returned from their voyage of exploration down the Mississippi River. Marquette, in failing health, spent the winter of 1674-75 near the portage, and passed over it on other trips, as did also René Robert Cavelier, Sieur de la Salle, Henry de Tonty, and many other Frenchmen until about 1700, when Indian hostility kept Europeans out of the area. The Indians continued to use the portage extensively. During the French and Indian War and the War for Independence, the portage resumed its important position in non-Indian travel and commerce. In the Treaty of Greenville (1795), the Indians ceded to the United States "a piece of Land Six Miles Square, at the mouth of Chickago River, emptying into the southwest end of Lake Michigan, where a fort formerly stood." In 1803, U.S. soldiers erected the first Fort Dearborn at the river's mouth, and trade continued to be extensive until the beginning of the War of 1812, when the residents of the fort abandoned it. They began the trip to Fort Wayne, but before they had gone 2 miles Potawatomi Indians murdered most of them and then set fire to the fort. In 1816, soldiers constructed the second Fort Dearborn, and trade again resumed over the portage. It diminished in importance, however, as the Illinois fur trade declined, though it continued to have commercial value into the 1830's. Work began in 1836 on the Illinois and Michigan Canalfinished in 1848which followed the water-and-portage route, as does the present Sanitary and Ship Canal. The western end of the Chicago portage route, where Marquette and Jolliet landed, is located in the Old Chicago Portage Forest Preserve, which is managed by the Forest Preserve District of Cook County, Ill. At the eastern end of the portage route, on the north end of Grant Park, are the sites of the two Fort Dearborns. In 1952, a cooperative agreement between the Cook County Forest Preserve District and the Department of the Interior authorized the designation of Chicago Portage as a National Historic Site.